I woke up Sunday morning & it was raining. Just a random little rain cloud that passed through, then it cleared up and was sunny the rest of the day. So that's what inspired this post.. I think many of you may know of my deep love of rain. Like, I really love it! It's so soothing & comforting. When I was younger & it would rain, I would open the back hatch of my mom's SUV, get some blankets & books and just sit in the car and enjoy the rain. I know some of you may think I'm crazy and wondering what's wrong with me. But I am sure there are a few of you who are right here with me in loving the rain too ;) Anyone else out there love the rain as much as I do? it & I can update with proper credits! source: kayodeok - thanks Linda! source: *Cinnamon - thanks Lauren! I love the rain. Rain makes me so happy! I love rain and I adore these images you've posted! Ths photo of the woman in the rain is priceless. Is that Leighton Meester? Jon and I got off work early one day (such a treat!) and opened our window, listened to the pitter patter and couldn't help but take a nap. It was the... most.relaxing.nap.ever! there is nothing crazy about enjoying the rain! i love rain, the air right before it comes down and afterwards, the glittering everywhere. kissing in the rain is eternal love. as a child, i used to open the front door, sat on a chair, my eyes closed, breathing in and out very consciously. inspired me to enjoy being alive and to write short stories and essays. Beautiful photos. Its raining here in Oslo, Norway today aswell! I love the rain, aslong as I dont get too cold and wet. Rain is beautiful and the wonderful sound it makes :D Makes me happy. The photos you've chosen are perfect. I, too, love love love the rain. However, I would really like for it to stop before Saturday, which is graduation day. That would be just fabulous. I wish I had your love and enthusiasm for rain, it would make where I live (Portland) all the more amazing. I do, however, love summer rain, and I really enjoy summer storms. Everything smells much sweeter afterwards. And that black and white photo of the couple kissing with Big Ben in the background is actually snow. The author is here: http://www.flickr.com/photos/kayodeok/4258335781/in/set-1213575. And the other image of the woman in the gray trench coat is Leighton Meester from the show Gossip Girl. I believe that exact scene was a recreation of the scene from Breakfast at Tiffanys when she was looking for her cat at the very end. Sadly, not sure where the source is...but I assume IMDb would be of help? I love the rain! My favorite EVER rain kiss is from the note book. I cry at that movie every time even though I've seen it a million times. I am so excited I found your blog today! I look forward to going back and reading older post so I can get to know you better. I would be delighted if you would visit my blog and tell me what you think. I am also having a giveaway that you might like. Oh I totally love the rain too! Absolutely 100% love it! I'm with you on the rain love but it has to be a proper rain shower - none of the miserable drizzle that we get so often here in Ireland. I always open my window wide so that I can listen to it. I too love the rain! I love umbrellas, rain boots, and just staying inside and curling up with a book while it pours outside! I Loooove rain too, which works out pretty well living in Seattle. Falling asleep to hard rain on the roof is one of my favorite things. The one of the girl with the purple umbrella is by Cindy Loughridge. Sometimes I love the rain. Sometimes I hate it! Living in southern california makes me appreciate it since we get so little of it. These past few days of rain have been a nice change! I woke up yesterday, looked out the window, and saw that it was raining. BOO! I do not like rain, but I did think of you... I actually thought "only crazy people like rain. danni must be loving this"
it's actually raining over here in KC too at the moment!! i like a light drizzle but not super heavy rain or hail!! I think the reason I love rain so much is that it's perfect excuse to pull on a cardigan an ignore the days to do's + instead, lounge around. So gorgeous. I love just listening to rain. It makes me think I'm out in the wild for some reason. Very romantic. It's called Nuit Blanche, and it's beautiful. I am with you on the rain! I love it too. I grew up in the south and we would have these massive thunder storms in the summer. Wild wind, rain, thunder and I'd be on the front porch curled up in the swing with a book. It was peaceful...and this sounds weird, but I loved the smell of rain and the wet driveways / streets in my neighborhood. The images relay such a poetic beauty! Its been raining for eleven days straight where I am in New England. A little rain shower may be nice, but try living over a week with no sunlight! Beautiful images!! Thank you for sharing. :) I think rain is awesome, and my favorite type of weather is when it's raining under the sun. SO COOL! Aw I love rain shots! These are amazing! Puh-lease come do a show up in Seattle! It's a win-win situation, really. I will get to see your pretty creations in person and you will (most likely) get rain! you would love where I live, Vancouver bc. it rains all the time here.... 10 months out of the year. no joke. living with that much rain you have no choice but to love it! I love rain, umbrellas, rainboots, all of it! I'm glad you made this post. All the photos are beautiful! It was raining yesterday, but my iphone tells me it's going to be sunny for the rest of the week! I think I'm the only one of all my friends/family who is bummed about that! I just bought new rainboots, too! Ha! Oh wow, what a gorgeous collection of photos! I adore the rain when I can watch it from somewhere warm and dry. Being stuck out in it on the other hand is icky. I love this post so much! 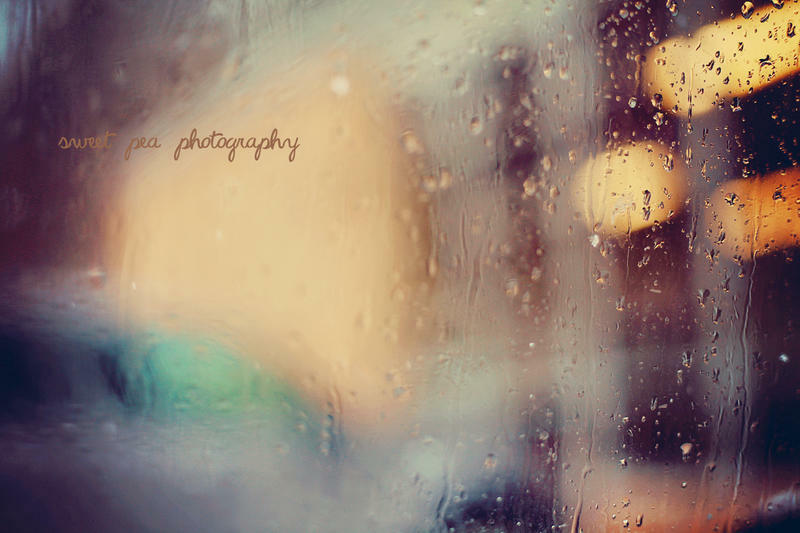 I love rain but only like proper heavy rain :) These pictures are really beautiful I could stare at them for hours too! I love your photos! The rain shots are amazing! i'm usually not much for rain but these photos are so beautiful! so pretty, Love the rain, I've always wanted to dance in it! !